The crit schedule becomes available one month prior to crit week in the Fall and Spring semesters. The schedule is available for viewing to anybody in Google Apps for Education (GAE) with a risd.edu email. Critiques will not be scheduled on the Thursday (Reading Day) or Friday (Liberal Arts and Graduate Final Exams) prior to crit week. Please note that when scheduling your crit(s) listing a location on the spreadsheet does not constitute reservation of the indicated space. Spaces outside the department must be reserved through reserveclassroom@risd.edu. 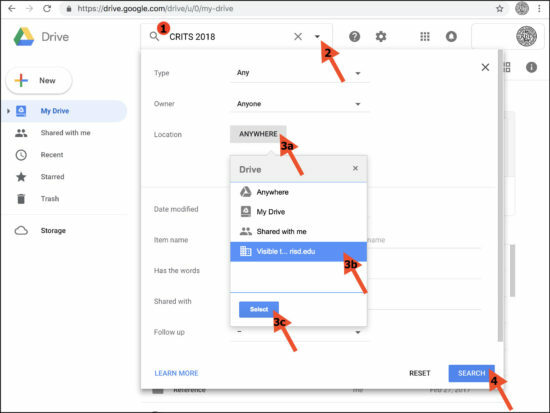 You can search your Google Drive for the schedule by following the steps below. Please note that you must be logged in with your risd.edu email account in order to access the spreadsheet. 2. Click the dropdown menu arrow on the right of the search box. 3. (A) Click the ANYWHERE button and (B) select “Visible to anyone in risd.edu” from the drop down options, then (C) Click the Select button. Please see the screenshot below for a visual.